Exchange of information and experiences: Both sides maintain contact with their partners in Munich and Ukraine via Munich Kyiv Queer. The groups and organisations of both communities discuss their work and the political developments in their countries: Topics include HIV-prevention, psychological counselling, self-help groups, political campaigns, lobbying and PR. Continuing Education: In order to learn from one another, we plan special workshops, study trips and internships in the areas described above. In process, each side benefits from the experiences of the other. Our target groups are volunteer and professional counsellors, social workers, HIV-prevention experts, cultural and project managers, the press etc. Culture: People might exchange their knowledge on a professional basis. But it is even more important to know and to appreciate each other. Cultural events like exhibitions, lectures, films, concerts and more help to open ourselves to the lives of the unknown others. Public Relations: We regularly inform LGBT and general press of both countries about our ongoing campaigns and actions. We want them to know about the Human Rights’ situation in Ukraine and put pressure on officials in both countries. 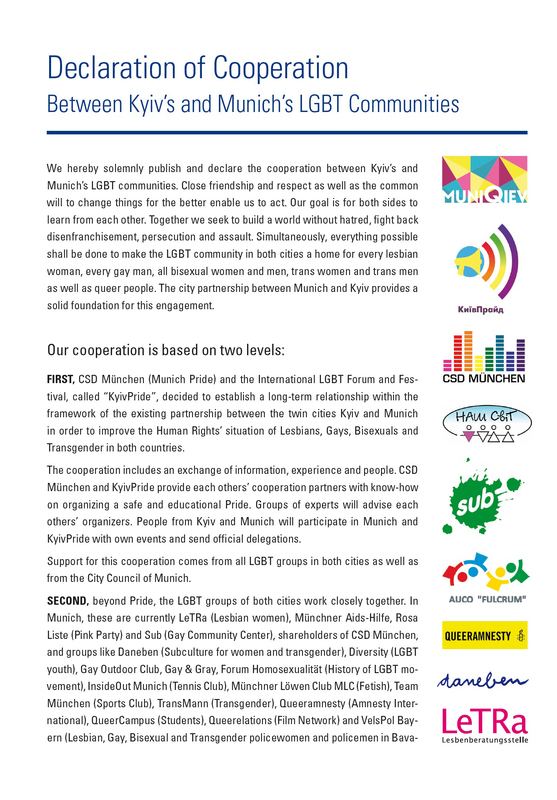 Pride Cooperation: KyivPride and Munich Pride (CSD) have begun a special relationship. Both partners share information, experience and know-how. Every year, delegations from both cities join their friends’ partner Pride; also they set up their own cultural programm for Pride Week and the coming year. Munich City Council supports the Kyiv-related work of Munich Pride financially. This year, we are going to focus our work on Ukraine. We bring to Kyiv and many other cities in the country projects we already tested, projects that are brand new, projects that need courage and commitment. As usually, we help to promote volunteers’ work, we try to put in creative protest, yes, we sing together and proudly present a new, big debate and a youth exchange programme. Munich and KyivPride, of course, have their own twin city program to whom we deliver our volunteers' ideas and craft. We all just want to live as we are. That is not the norm everywhere. We need support for our planned projects. even a small donation has a big impact. the Sub will provide you with a donation receipt. 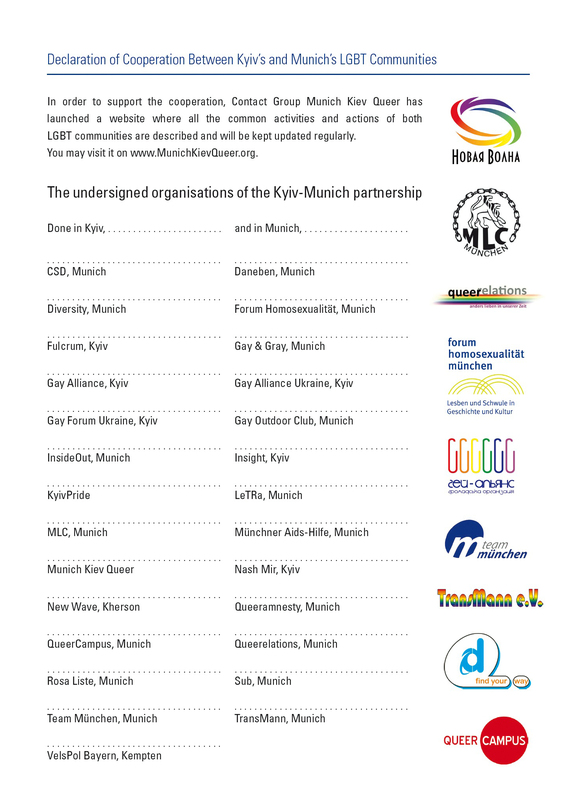 The Kyiv-related work of Munich’s LGBT-community is supported by the Munich City Council, in particular by Dominik Krause (Bündnis 90/Die Grünen) and Thomas Niederbühl (Rosa Liste); Lord Mayor Dieter Reiter is also involved. We are backed up, too, from Bavarian Parliament by the deputy Tessa Ganserer. Munich Kyiv Queer cooperates with the Koordinierungsstelle für gleichgeschlechtliche Lebensweisen, which is kind of a municipal centre for the non-discrimination of LGBT-lifestyles. We talk to the International Office of the City of Munich and work with the Arbeitsforum Ukraine based at Munich’s university LMU. 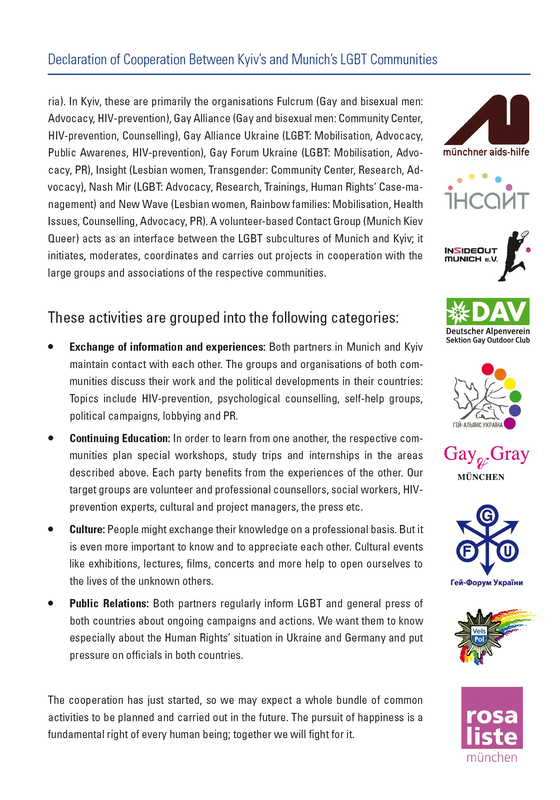 In Kyiv, the contact group Munich Kyiv Queer cooperates with the German Embassy, the Gesellschaft für Internationale Zusammenarbeit GIZ (German Society for International Cooperation), the Goethe-Institut and, last but not least, the Heinrich Böll Foundation. Our contact base is growing continuously.